Chakli makers are of different types. One which i have is as shown below. 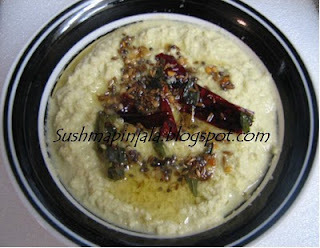 Add udad flour, cumin seeds, ajwai, soda,salt and chilli powder to rice flour and mix well. Now melt butter and add to rice flour. Mix well. Now add water little by little and make as chapati dough. Oil should not be too hot or too cold. Now fill the chakli maker with little amount of the dough. U can use any mould as u wish. In the above pic u can see 6 moulds. 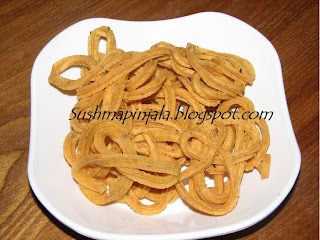 I have used the star one to makes these chakli's. Now press the chaklis directly into the oil and fry. Be care ful as the oil is hot. Fry till golden brown and remove. 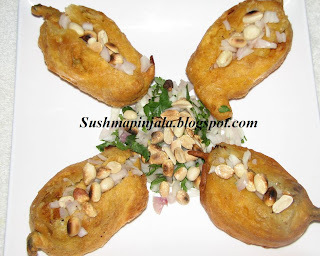 Enjoy this crunchy and crispy snack with ur tea or coffee. Peel the skin of snake guardand cut them as rounds with 1/4 inch thick. Boil them in 1/2 cup water adding pinch of haldi. Remove and squeeze out excess water for it and keep aside. Heat pan and add oil. Now add mustard seeds, cumin seeds, curry leaves, chana dal and red chilli. Now add lengthwise cut onions, this is optional but i love to add. Saute for 5 mits and add cooked snake guard pieces. Mix well and add salt and chilli powder. Cook for 10mits on medium flame and garnish with cilantro. Heat presser cooker or any small cooker which u have at home. Add oil and add mustard seeds, cumin seeds, red chilli and chana dal. Fry for 3 mits and add ginger garlic paste and green chillies. Saute for 3 more mits and add tindora pieces. Add haldi, salt and chilli powder. Mix well and add 1 glass water and presser cook. Remove lid cook for some more time if water is left out. 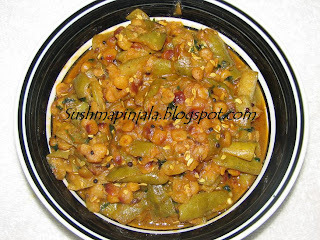 Garnish with cilantro and serve hot with rice or chapati. 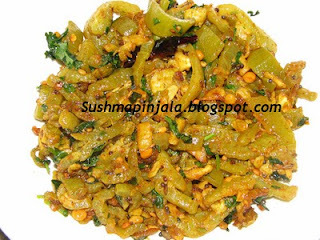 Wash the chillies and make a slit to it from top to bottom just to fill masala into it. Now make the filling masala. Take 1sp besan/gram flour add very little salt, ajwai, and tamrind pulp. Mix well it should be thick not too thin. Now fill the masala into the slit chillies and keep aside. Now make the batter for the bajji's. 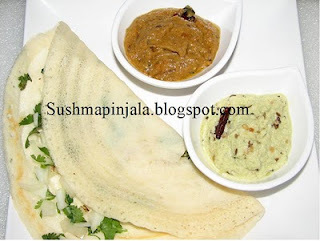 Heat dosa pan and spread some of the batter on pan and make as dosa. Now on top of that sprinkle some if the chopped onions,green chillies , grated coconut and cilantro. After 2 mits turn the dosa to other side and cook for 1 more minute. Now turn again and fold to half as shown in the above picture. 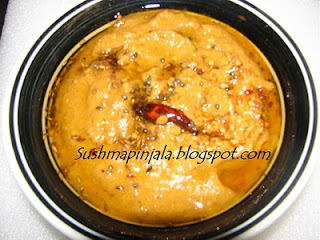 Serve hot with any chutney as per ur taste. I have served with coconut chutney and tomato capsicum chutney. Heat 2 sps oil in pan and add medium size cut tomato and capsicum. Saute for 5 mits and add garlic, sesame seeds, cumin seeds and gree chillies. Let them cook till soften. Now add tamrind pulp, mix weel and let it cool. Now grind this mixture to thick paste. Heat small pan and heat oil. Add mustard seeds, cumin seeds, udad dal, curry leaves and red chilli. Add this tempering to the chutney and serve with dosa, idly, chapati, and also with rice. Grind all the ingredients except tempering ingredients to paste. Add little water if required. Now heat small pan heat oil and add mustard seeds, cumin seeds, curry leaves, udad dal and red chillies. Now add this tempering to the chutney.